Welcome back for another season! We will follow the same procedure as previous seasons. Everyone should send me their requests for the following week by Thursday night at 10:00PM. So for the week of Sunday, March 24th - Saturday March 30th, all requests should be submitted no later than Thursday, March 21st @ 10:00PM. 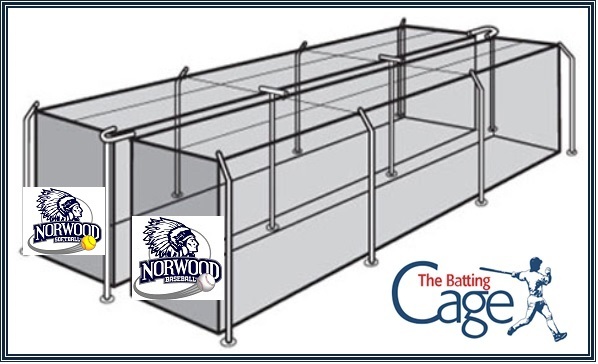 Batting cage requests will be assigned the order in which they are received and will be done weekly. LAST SCHEDULED TIME FOR RIGHT NOW IS 7:00 UNTIL IT STAYS LIGHT LATER. Calendars are updated within 2 hours of a time being requested. IF you have schedule change and will NOT be using the cages your scheduled time, please let me know so I can clear the time slot to make it available to someone else. Common courtesy. Please do NOT just show up at the batting cages. Please send me a quick email and I will add you if it's open. My emails and the calendar are on my phone, so I respond fairly quickly. I don't want phone calls or emails because anyone is fighting over cage space. If this happens, you will be asked to leave the cages. Most of us learned to share at a young age...most of us. Let's teach the players that as well. All requests and questions should be sent to Mary Kramer at mmack.norwoodac@gmail.com to guarantee the request has been received. Batting cage times will be updated for the following week as they are received, but no later than Friday morning. This schedule is being done weekly. To be fair to everyone, do not send me a request for 2 weeks from now.